Over the past two-plus seasons as the Indiana Pacers enjoyed their unexpected rise, they were a team that was known for its unfailingly sunny disposition and a steady, even if at times irrational, confidence. After being scarred by a series of negative incidents over the previous decade, it was that genuine togetherness and collective interest that won back many of the fans who had turned their backs on the basketball-crazed state's flagship team. That existing foundation makes the Pacers' crumbling season such a challenge to understand and impossible to have predicted. Teams across the league yearn for such chemistry and stability -- it is those ingredients that traditionally allow teams to fight through challenging times. Instead, the Pacers have been internally fracturing. Monday they lost 103-77 to the San Antonio Spurs, a team that is now winners of 18 in a row but also knows a thing or two about battling through adversity, having done it quite a bit this season. It was an important game for both teams, but the Pacers, who had been 33-4 on their floor this season, fell down fast and never recovered. Ron Hoskins/NBAE/Getty Images Kawhi Leonard and the Spurs earned an 18th straight win, pushing Indy out of the East lead. 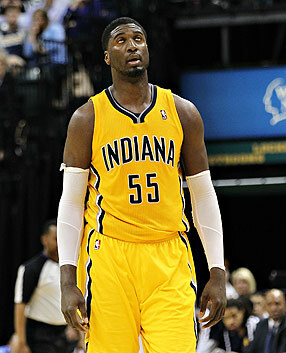 "We've been in a downward spiral," Pacers center Roy Hibbert said. "And we've been splintering a little bit." The numbers tell the story. The Pacers were 8-10 in March and they're just 13-13 in their past 26 games, nearly a third of a season of average basketball. Their offense, always the weak spot, has collapsed. They have failed to crack 80 points in five of their past six games. Their one-point victory over the Miami Heat last week now seems like an outlier when looking broadly at the Pacers. For the first time all season, the Heat have passed the Pacers for the No. 1 spot in the Eastern Conference. The Pacers are experiencing a leadership void at the moment and the only thing they're racking up faster than turnovers and bad shots is finger pointing. During a timeout in the second half, George Hill got into a verbal confrontation with Lance Stephenson on the bench and they had to be separated by teammates. Paul George has battled some negative attention and has turned away some teammates' offers for support during it. Hibbert has gone on the record calling his teammates selfish. Team president Larry Bird has gone on the record essentially calling his coach, Frank Vogel, soft and his players not committed enough. Barely a game goes by when one Pacer or another doesn't seem to be angry at Stephenson for something. Often he earns it, be it ridiculous technical fouls or bizarre decisions, but Stephenson is rarely guilty of not playing with commitment, as Bird has questioned his teammates on. After there's been a dearth of passing in recent weeks, the Pacers were overpassing at times against the Spurs, which just played into San Antonio's ability to help-and-recover. Hibbert, frustrated by a lack of touches recently, forced some shots. George, who has been criticized for not acting like the superstar he is, tried too hard to take over and found himself going 1-on-3 as he tried to will himself into making plays in what turned out to be futile second half. All those are the symptoms, what is happening is this once close-knit team is buckling in the transition from potential to expectation. Most of the Pacers haven't dealt with these types of demands before and those who have, like Andrew Bynum, aren't in position to help them through it. That includes Vogel, whose first three years on the bench were mostly a merry-go-round until now, and he's struggling to find ways to pull his team out of it. Right now the Pacers are missing two veteran voices they came to count on over the past few seasons. Danny Granger, the longest-standing member of the team and one of George's close friends, is now playing for the Clippers. Former assistant Brian Shaw, who was not afraid to be the bad cop on the bench, is now the coach of the Nuggets. "We've had plenty of players-only meetings and plenty of sit-downs as a team with coaches and we've had some upper management in here, so I don't know," Hibbert said. "Maybe we should all go to group therapy or something ... figure out some of our grievances." Vogel held a long meeting with his players and then his coaches after the latest loss on Monday. But likely nothing said there hasn't been said in some way before. He's attempted to make adjustments, changing up his rotations and his roles. He benched Evan Turner, the midseason acquisition who has landed in a quagmire that he wasn't involved in creating, in the second half for Rasual Butler, the veteran who is perhaps the most stabilizing voice in the locker room currently. But Butler, who hasn't played much all season, was unable to turn the tide. The Pacers still have the league's top defense, though it was unable to slow the storm surge that is the Spurs on Monday. They've also barely had any practice time because of a taxing March schedule that saw them play five back-to-backs and 11 road games. Defense, practice and their institutional knowledge still gives them a chance to recover. Whether it will be in time to get that top seed they've been chasing all season is another matter. "The No. 1 seed is the last thing on our minds right now," Vogel said. It isn't on the minds of the Spurs, either, though it should be. Beating the Pacers after beating the Heat earlier in the streak has put the Spurs in prime position to clinch home-court advantage should they reach the NBA Finals again. Coach Gregg Popovich and his team have been ambivalent about their franchise record-setting run, and Popovich has gone so far as to say the Spurs need a loss to help them refocus. "We've never had any numerical or positioning goals, ever, not one time," Popovich said. "We've never talked about [our seed] the entire time I've been here. The only thing we talk about is trying to be the best team we can be come playoff time. That's what we harp on, period. We don't talk about anything else." But this fact is out there: The Spurs have gone to the Finals five times and the four times they had the home-court advantage, they won. Last year, obviously, not having Game 7 at home was rather important, just as it was in 2005 when the Spurs beat the Detroit Pistons in Game 7 on their home floor. Monday was the first game in an eight-game run the Spurs will play against teams with winning records, with five of those games slated for the road. Thursday they play what could be a pivotal game for Western Conference home-court advantage against the Oklahoma City Thunder on the second night of a back-to-back. Which meant handing the Pacers just their fifth home loss of the season, even if it was just one of a string of 18 impressive victories now, still had some meaning. "This was a good win for us," Tim Duncan said. "To continue the streak, all that is good. We'll worry about a couple of things, staying healthy, finishing the season strong and hopefully going into the playoffs with the confidence we're playing with now." MVP: No Blake Griffin? No problem. Other players picked up the slack for the Clippers. Like Darren Collison, who managed to outscore the Timberwolves by himself in the third quarter (16-15). And DeAndre Jordan, who had 11 points, 24 rebounds and 4 blocks. Defining moment: Early in the third quarter, the Wolves were up 59-57. Then the Clips went on a 31-5 run and built themselves a 24-point lead in the period. Collison was the driving force during that scoring surge. That was ... a beatdown: Don't let the Clippers' margin of victory deceive you. This was a blowout in every sense of the word. The only thing the Timberwolves were able to do in the fourth quarter was make the final score respectable. MVP: Zach Randolph went for 20 and 11 on the night, including 13 points in the third quarter to pace the Grizzlies. Randolph was just too big and strong for Kenneth Faried and Jan Vesely to defend, and Memphis exploited it. X factor: Mike Conley scored 19 points on the night, including a 3 that put Memphis up five with 35 seconds left. Every time Denver got close Conley had an answer to keep the Nuggets at arm's length. That was ... gritty. Second nights of a back-to-back are always tough, but playing them in Denver just adds difficulty. Memphis got up early and held on thanks to timely buckets from Conley and Randolph to hold serve in the Western Conference playoff race. MVP: Unsurprisingly, Carmelo Anthony. With Amar'e Stoudemire resting for "maintenance" (quote: Mike Woodson), Carmelo returned to the PF position for New York; he scored 34 points and accumulated eight rebounds. LVP: Jazz guard Diante Garrett went 0-for-8, poor shooting by any definition. Worse, according to SportVU, seven of those eight misses were uncontested. He wasn't alone, though: The Jazz shot 29.5 percent on uncontested looks. That was ... scary: Knicks rookie guard Tim Hardaway Jr. came up limping in garbage time, heavily favoring his right leg in what appeared to be a pretty serious injury. Fortunately, a sprained ankle was the diagnosis. MVP: Lou Williams lit up his former team for 22 points in 24 minutes off the pine, including 11 in the fourth quarter of the game to ice it for Atlanta. Williams also added five rebounds and five assists, and his clutch play down the stretch helped the Hawks seal a game they had to have for playoff positioning. X factor: Monster game for Paul Millsap. He posted a season high with 16 rebounds and provided consistent offensive output throughout the game with 28 points. He patrolled the paint for the Hawks and also added four assists. The SIxers didn't have an answer for him defensively. Defining moment: The fourth-quarter play of Williams. As he did so many times for the Sixers, he produced for his team down the stretch. Williams posted 11 points in the fourth quarter off the pine, including a couple 3s. MVP: Joakim Noah. The Bulls' center continued to strengthen his case as one of the best all-around players in the game by doing a little bit of everything against Boston. The big man posted 19 points, 11 rebounds, 5 assists, 2 steals, 2 blocks and a game-high plus-26. X factor: Fourth-quarter defense. After playing a back-and-forth game over the first three quarters, Chicago turned up the intensity on Boston down the stretch. The Bulls limited the Celtics to just four points over the first eight minutes of the fourth quarter, helping the hosts pull away via a 17-4 run. That was ... entertaining. Rajon Rondo did not play due to rest, but still remained active off the floor. The point guard made his debut as an analyst, providing insightful color commentary on Boston's TV broadcast for the first half of the contest. MVP: Chris Douglas-Roberts and Al Jefferson are your co-MVPs. Douglas-Roberts was a model of efficiency (7-for-9) and the game was his runway. Jefferson played a team-high 40 minutes despite being sewn up to the tune of seven stitches, and scored eight points during the Bobcats' key fourth-quarter push. That was ... puzzling. Let's reconcile the following truths: Kemba Walker was 6-for-22 from the field, and 0-for-10 on 3-pointers. He was also a team-high plus-16 in plus/minus differential. The eureka factoid is this: Walker was 9-for-10 from the line, and the Bobcats as a team shot 29-for-34 from the charity stripe. The Wizards only attempted 13 total free throws. Defining moment: The Bobcats, having just crossed the threshold of an unlikely, defense-driven comeback, found themselves up 95-92 with 2 minutes remaining. Charlotte manipulated the clock by collecting two consecutive offensive rebounds, all the while siphoning away Washington's last remaining resource: time. MVP: Greg Monroe. Josh Smith caught fire in the fourth quarter (15 of his 26 points), but Monroe kept the Pistons in the game when Milwaukee was playing well. In addition to snagging 14 boards, Monroe scored a game-high 28 points on an assortment of savvy post moves. LVP: Charlie Villanueva. In his scoreless, eight-minute second-quarter stint, the Bucks pillaged a sorry Pistons defense for a treasure trove of dunks and layups. In total, the Bucks scored 26 of their 31 second-quarter points in the paint. Villanueva didn't get off the bench in the second half. That was ... a good rookie outing: Giannis Antetokounmpo scored 14 points on six shot attempts and finished with a plus/minus rating of plus-15. (No other Buck finished above plus-2.) He also made both of his 3-point shots. For good measure, he threw down a backward dunk on a backdoor cut. MVP: DeMarcus Cousins bounced back from two subpar games against the Oklahoma City Thunder and Dallas Mavericks. The Kings starting center finished with his 46th double-double of the season: 35 points on 13-of-18 shooting and 14 rebounds. He also set a milestone in Monday's win by scoring his 5,000th career point. X factor: With Isaiah Thomas missing in action, Ray McCallum has grown by leaps and bounds. Tonight, the Kings rookie guard played with great confidence and finished with his first career double-double: 22 points and 10 assists. McCallum also took great care of the ball, committing just one turnover in the win. That was... a sign of growth for the Kings rookies. In addition to McCallum's splendid performance, the Kings also got a productive night out of Ben McLemore. Last year's seventh overall pick finished with a solid line --14 points on 5-of-11 shooting from the field. 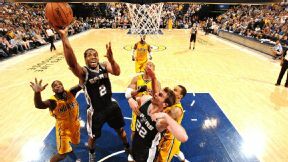 San Antonio Spurs: The Spurs set the franchise record with their 18th consecutive victory, 103-77 over the Pacers. According to ESPN Stats & Information, the Spurs had an offensive efficiency of 124.8 Monday, their second-highest efficiency during their 18-game win streak. Since their last loss on Feb. 21, the Spurs lead the league in offensive (112.5) and defensive efficiency (96.5). Indiana Pacers: The 103-77 loss to the Spurs put the Pacers percentage points behind the Heat for the East lead. The Pacers have lost three straight and finished March with an 8-9 record -- and with the lowest scoring average of any team in the league. They have lost five of six overall and seem to be in full panic mode with seven games left in the regular season. 18 not bad but still got a long way to go!! Go spurs go!!! "The No. 1 seed is the last thing on our minds right now." -- Frank Vogel, after Indiana dropped out of first in the East. Pat Lovell/USA TODAY Sports Roy Hibbert had 15 points as the Indiana Pacers took another dispiriting loss, a rout at the hands of the West-leading San Antonio Spurs. The Spurs overcame subpar shooting performances by Tim Duncan (3-for-10) and Manu Ginobili (2-for-6) to rout the Pacers, 103-77 in Indianapolis. San Antonio has won the last five games in which Duncan and Ginobili both shot under 35 percent, dating back to March 2011. And the Spurs are 15-8 overall in such contests since Ginobili joined the team in 2002. San Antonio is the third team in NBA history to post a road win of more than 25 points over an opponent that entered the game with a winning percentage of .700 or better at least 50 games into a season. The Nets won 124-93 at Phoenix (which had been 46-13) on March 13, 1993. And the Trail Blazers routed the 48-14 Spurs in San Antonio by a score of 136-106 on March 8, 2013.